We have typography on the web! As John Allsopp points out in his blog Happy 17th Birthday CSS we have come a long way but we still have very far to go. When I first started playing with web design back in 1996 the web was just plain. It was meant as a way to exchange information, not produce the high-end, high-gloss content we see today. Surprisingly enough we’ve had the ability to embed fonts for over a decade. CSS2 included the ability to embed fonts when it was first released but it wasn’t highly used until CSS3 came out and fount foundries decided that there was money to be made online. Unfortunately every time we want to work with web fonts the ugly licensing monster raises its head. It’s not just a matter of purchasing the font, converting it to the correct formats (see How do we add fonts to the web? for the actual formats and process involved) but it also involves making sure that the font license allows you to use the font with @font-face techniques (read the EULA that comes with your font to make sure). Information around the web isn’t exactly clear on this but my opinion is that the @font-face method isn’t really “embedding” but instead linking because you’re simply telling the browser where the actua font file is via CSS. This means the font file is directly accessable to your visitors, making this method quite different than the ones listed above. Even if the font license permits font embedding, it may not permit embedding with @font-face because this method allows direct access to the font file. Microsoft uses the .eot font format (Embedded OpenType) as a solution to this problem. EOT is supposed to respect the flags in the font files for embedding and can be limited to specific domains. Non-IE browsers however, have not adopted this technology and don’t plan to. That means you’ll need to use a .ttf or .otf version of the font for non-IE browsers if you want true cross-browser compatibility. If you decide to use @font-face, be absolutely, positively sure that the font license allows it. It should specifically state the use of @font-face is permitted and if there are any additional restrictions (ie. give credit somewhere). Can I use an Adobe font on the web? A font’s usage permissions are specified in your EULA that accompanied the font when you acquired it. Refer to your EULA to determine the type of usage permitted. The Adobe Typekit service provides secure, subscription-based web font hosting for web designers and developers, made possible by the @font-face rule. Typekit subscribers have access to a collection of fonts that can be used on basically any web site. You can view the Adobe Web Fonts available on the Typekit service on Adobe’s foundry page. Although Typekit relies on the @font-face rule to work, it is different from web fonts used by end users. Fonts remain protected on the Typekit servers and are dynamically delivered to browsers in the appropriate format to ensure an optimal and consistent typographic experience. Typekit offers user-friendly integration with CSS and HTML code, and other optimizations, like font subsetting. I’ve loved Stone Sans Humanist ever since I first saw it used in an MIT Press book (The Second Self by Sherry Turkle, I belive). I loved the way that it flowed on the page and how it looked. I didn’t know any better to know the technical aspects of the font. I only knew I really liked it. Fast forward 12 years. I’m working on an eBook project and I decided I wanted to use my favorite font in my own project. Not only the font wasn’t available for embedding at the time but the cost to license the font for embedding in an eBook was prohibitive at the time and it was very restrictive. That is the primary reason why I’ve turned to free/open source fonts for most of my work. I’ve also subscribed to the full Typekit service to make sure that the fonts I want are available for the projects I work on even this will not solve the problem because not all fonts are available for all providers (sadly Stone Sans Humanist is not available through Typekit nor through the vendor’s free font service; you). Where do I find fonts for embedding? Where do we find good and free fonts? How do we add fonts to a web page? One of the first things we need to realize is that there are multiple fonts for a given type. For most people making a font bold is just a matter of highlighting the text and pressing Command (or Control) + B but for graphic designers and other people who work with type (online and off) that is sacrilege. When you make a font bold you’re actually assigning a bold font to the text. See the Pen Example font-face declaractions by Carlos Araya (@caraya) on CodePen. See the Pen Typekit font import by Carlos Araya (@caraya) on CodePen. The code above will only work for a single website, specified on the account where the kit was created from. HTML Link in the head of your document along with your style sheets and scripts. See the Pen Google Fonts HTML Link by Carlos Araya (@caraya) on CodePen. CSS Import from your CSS files. p>See the Pen Google Fonts CSS Import by Carlos Araya (@caraya) on CodePen. Using the following @font-face declarations we have taken care of the defaults for each @font-face declaration by making the bold and italic fonts actualy be bold and italics and, unless the font is actually condensed or stretched, make it explicit that it’s a normal font, not stretched or compressed (if we need to change this we can do it for specific elements). Another issue to consider is that not all browsers support the same fonts (surprise, surprise). Internet Explorer supports Embedded Open Type fonts, Firefox prefers WOFF, Chrome, Safari and Opera prefer OTF (Open Type Font) or TTF (True Type Fonts) fonts and iOS prefers SVG (Scalable Vector Graphics) fonts. I built the @font-face declarations below using Paul Irish Bulletproof @font-face syntax. The original article is a little dated but it is still the best way to work with @font-face declarations on the web because it preserves the same font across all browsers and devices. See the Pen Multiple @font-face assignments in a single CSS file by Carlos Araya (@caraya) on CodePen. See the Pen Finetuning elemements with @font-face defined fonts by Carlos Araya (@caraya) on CodePen. The Flash of Unstyled Text is a phenomenon in Firefox and Opera that few web designers are fond of. When you apply a custom typeface via @font-face, there is a brief moment, when loading the page, where the font hasn’t been downloaded and applied yet, and the next font in the font-family stack is used. This causes a flash of a different (typically less good looking) font, before it gets upgraded. Unless you’re designing for ancient browsers (Firefox 3.5 and 3.6 and Opera from th at same time period) FOUT shouldn’t be that big an issue anymore. See the Pen Setting up italics fonts for H1 tag using @font-face defined fonts by Carlos Araya (@caraya) on CodePen. See the Pen Assiging bold weight with a @font-face defined font by Carlos Araya (@caraya) on CodePen. See the Pen Comparison between numeric values of the font-weight property by Carlos Araya (@caraya) on CodePen. The result of the rule above will depend either on available font faces within a font family or weights defined by the browser. One additional consideration is that we need to make sure to differentiate the page’s hyperlinks from the content that we choose to underline. Otherwise it’ll be confusing for our users when they try to click on underlined content and nothing happens. See the section on hyperlinks related pseudoclasses for more information. The font-stretch property, available in CSS3, selects a normal, condensed or expanded face from a font. In order to see the result of the selection, the font being used has to have a face that matches the value given. The font-stretch property will not work on just any font, but only on fonts that are designed with different faces matching the defined sizes and that is available on the user’s computer or loaded with a @face-font rule. The font-variant property allows you to change the targeted text to small caps. It is available in CSS2 and CSS3 with the later assigning additional values to the property. CSS3 introduced additional values for this property that are dependenant on features from Open Type being available on the font we are using. titling-caps Enables display of titling capitals (OpenType feature: titl). Uppercase letter glyphs are often designed for use with lowercase letters. When used in all uppercase titling sequences they can appear too strong. Titling capitals are designed specifically for this situation. In typography, kerning (less commonly mortising) is the process of adjusting the spacing between characters in a proportional font, usually to achieve a visually pleasing result. Kerning adjusts the space between individual letter forms, while tracking (letter-spacing) adjusts spacing uniformly over a range of characters.1 In a well-kerned font, the two-dimensional blank spaces between each pair of characters all have similar area. The font-kerning property is supposed to provide optical kerning for the font being used. It is not widely supported (if at all). I’d suggest using letter-spacing instead. It may not have the same fine grained control Kenrning does but it’s better than nothing. Letter spacing is more widely supported and allows you to control the spacing between letters in an element or class. Look at the example below. start: The same as left if direction is left-to-right and right if direction is right-to-left. end: The same as right if direction is left-to-right and left if direction is right-to-left. left: The inline contents are aligned to the left edge of the line box. right: The inline contents are aligned to the right edge of the line box. center: The inline contents are centered within the line box. : The first occurrence of the one-char string is the element used for alignment. the keyword that follows or precedes it indicates how it is aligned. This allows to align numeric values on the decimal point, for instance. This property is not currently supported in any major browser. justify: The text is justified. Text should line up their left and right edges to the left and right content edges of the paragraph. match-parent: Similar to inherit with the difference that the value start and end are calculated according the parent’s direction and are replaced by the adequate left or right value. This is only supported in Chrome. This property indicates hw far you push the first line of text from the starting border (depending on direction of the text). Additional values control whether the indent is a hanging indent and whether it applies to only the first line or the entire block of text. Percentage (i.e: 20%): Indentation is a percentage of the containing block width. each-line: Indentation affects the first line of the block container as well as each line after a forced line break , but does not affect lines after a soft wrap break . Introduced in the CSS3 Text Module and not currently implemented in any major browser. hanging: Inverts which lines are indented. All lines except the first line will be indented. Introduced in the CSS3 Text Module and not currently implemented in any major browser. p>In order to style appropriately links, you need to put the :hover rule after the :link and :visited rules but before the :active one, as defined by the LVHA-order: :link — :visited — :hover — :active. ::first-line does something similar but with the entire first line of the matching element. This matches when printed publiccations some times have a first line of a chapter in a slightly larger font than nthe rest of the text. In the example below we’ve set the text of the first line to 1.3 em. When I first started working on web development I had absolutely no clue as to what typography was or how to make pages ‘look’ visually pleasing, easier to read and more engaging to the user. Over the years I’ve developed a sensibility to the way text lies on the page, how it relates to the other elements on the page and how to make the text pleasing and easier to read. In more recent times I’ve learned the science to go along with the art along with the tools and resources to make it happen. What does the text tell you? What kind of content are we creating? There are multiple ways to select what fonts you will use and there are multiple strategies to select the fonts. Some people will tell you to use a single font, some will tell you to use whatever will work best for the project at hand. I subscribe to this last philosophy: If a single font will do the work then by all means use a single font; however if more than one font will work better then mix the fonts as needed. We can use words as well as images when developing our content. In searching for fonts look for trigger words and moods. What words resonate the strongest when reading or interacting with the text? “In much the same way as we gather visual inspiration at the outset of our process, we might also begin to consider gathering verbal inspiration when we embark on a project. These verbal palettes or wordboards can help us define a design’s tone and voice and, as we’ll see shortly, are every bit as important as look and feel”. There are multiple sources on information when it comes to researching fonts. Designers may not always have the time to do all this but the more you can do the better your design will be for it. Does it give you the information you need to decide whether the font is good for what you want it for? Based on the answers and the questions above we can now go ahead and select the anchor font for your document. In my experience this has always been the main body font as it is the one that will appear the most often in your content. You may have chose to use a single font for your entire project. Most likely you will find one or more additional fonts that will supplement and complement your original font. The main question to ask about related fonts in how they relate to your primary anchor font. Creating specimens for each font by itself (see the section specimens below for more information about specimens) and creating a sample of your content using the proposed font combinations may give you the answer regarding the usefulness of your font. Taken from http://sixrevisions.com/css/css-typography-01/ and expanded with examples and additional information. All fonts in the same font stack should look similar to each other. Some fonts are wider or taller per letter than others are, giving them larger aspect ratios and the appearance of being different in size. Generic Font Families are a last-resource fallback intended to work when no other font in the chosen stack is available. [blockquote]Generic font families are a fallback mechanism, a means of preserving some of the style sheet author’s intent in case when none of the specified fonts are available. Generic family names are keywords and must not be quoted. A generic font family should be the a last alternative in the list of font family names. cursive Glyphs in cursive fonts generally have either joining strokes or other cursive characteristics beyond those of italic typefaces. The glyphs are partially or completely connected, and the result looks more like handwritten pen or brush writing than printed letterwork. Now that we have our scale, Let’s start with the next obvious question. What impacts a page’s vertical rhythm? In order to achieve a good rhythm we have to calculate these three factors and apply them in our CSS. Here is an example of text without a good rhythm. As you can see, the rhythm is off. After the first line the baseline does not remain constant. 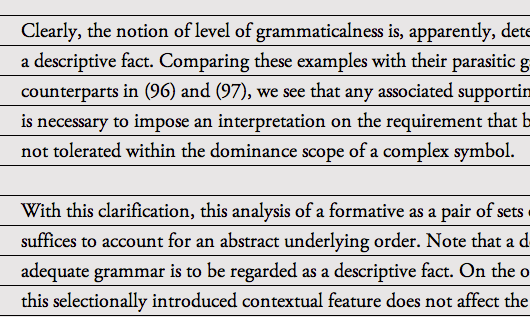 The further down you go in the paragraph the harder it gets and, consciously or not, reading the text gets harder. Before we can start working on the rhythm we need to pick a time signature, or base font-size to calculate our rhythm from. For this essay, and for most of my work, I’ve selected 16px to make things easier to do the math. A line height of 1.25 x the base font size is a great place to start, based on the font face and size. The starting CSS will have set the body font-size: 16px and line-height: 1.25 (without a unit). We’ll build from there. Vertical Rhythm is simply when a body of text is aligned to evenly spaced horizontal lines (think of your lined paper from grade school), making it more cohesive and easier to read. Which ones is easier to read and “flows” better? We will look at what makes text flow with good rhythm, explore the typographical elements that make the flow and rhythm happen and, in the next part, we will build the SCSS, CSS and HTML elements that we need to flow our text successfully. It’s fairly easy but until I started looking more systematically at what typography it wasn’t something that even crossed my mind. Yet it is one of the keys to making typography work online and use type as the basis of our online decisions. I picked 24 as my second value to apply to my modular scale generator and the Golden Ratio (1: 1.618) to build my scale. From what I’ve learned the second value is not as important but a secondary reference. 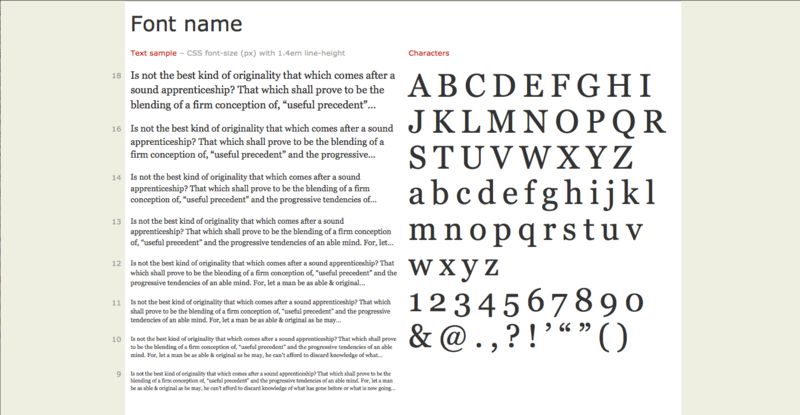 The web font specimen, discussed in this A List Apart article and available from http://webfontspecimen.com/ allows you to create a professional font specimen of a font of your choice. As your work with typefaces continues to grow, you’ll find that you have a large list of specimens available. Don’t delete them; put them somewhere on your testing web server (whether it’s hosted online or living in your laptop) as a reference material for future projects. Please do not reinvent the wheel. The Frontfriend bookmarklet let you play with fonts without having to customize the page for every single font that you want to test. Using the web font speciment we discussed above we can test fonts without having a page using the actual fonts. We can test with Google web fonts and with our own local fonts. Take the fonts you’ve chosen and build a portion of your website using them. This will give you one final opportunity to check the fonts in the layout and flow you’ve developed so far… if it doesn’t work then this is a good point to look at alternatives. Now that we have specimens and our content built with the fonts we’ve chosen, we test… we test… and we test again and we test in as many devices as we can get our hands on to, either virtual (using tools such as Type Rendering or in actual devices. In the article Test on real mobile devices without breaking the bank Brad Frost discusses what should be the minimal setup that we need to test in mobile devices in addition to the standard set of browser/operating system combinations for desktop browsers. It sounds like a lot but it’s a good view of what devices we need to test in but will also depend on your target devices and technologies. Even within the same family of devices, Android for example, look very different depending on the version so we need to test in appropriate devices and versions of the browsers we’ve selected. Now that we have decided on our fonts, our scale and complementary fonts, if any, we are ready to move into CSS action. We’ll look at building our font stacks, and the different elements of building our typography for the web.